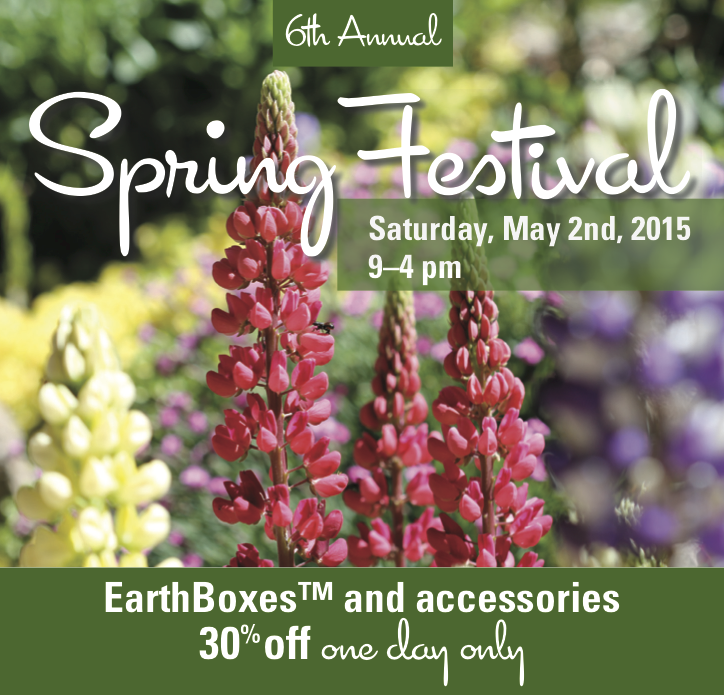 Our 6th annual Spring Festival is Saturday May 2nd, 9-4. Come and celebrate the start of the growing season with this family friendly event. Come and see what’s new for the season, and enjoy prize giveaways, one day only specials, face painting (from 11-2), a kid’s garden activity and a petting zoo. Our first 50 paying customers of the day receive a free gift! Honor the moms in your life. Inspire her with a colorful hanging basket or a pre- made planter from the greenhouse. Our gift shop has a huge selection of unique items. From luscious bath products and kitchen accents to whimsical garden art, we have a pleasing selection of gifts to make mom feel special. Don’t forget the card! We have a huge selection of unique and beautiful cards just for Mom. Call or stop by our Flower Market and have our florists create a striking arrangement for mom. Choose from a large selection of beautiful cut flowers to personalize her bouquet. For your convenience, we deliver throughout Teton Valley. 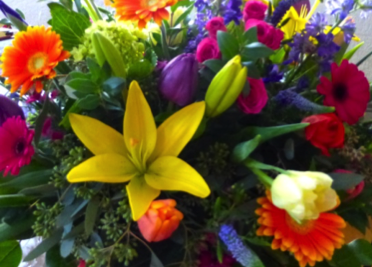 Early Bird Special: Free local delivery with flower orders placed by 6pm Monday May4th. Carefully choose the right site. Ensure the spot you want to plant a tree will accommodate its eventual size. The cute little Colorado spruce you purchased in a 5 gallon pot will not seem that cute anymore when it’s 20 feet tall and blocking your Teton views! Not too deep, not too shallow. Renting a backhoe to dig some planting holes? Great, but beware of plunging your tree too deeply into the earth. The top of the root ball should be level with the top of your planting hole. This allows for proper oxygen exchange and drainage. Conversely, shallow planting holes make it difficult to water the roots of your tree as the water pour right off the root ball and into the surrounding soil. Amend the soil. Adding a soil amendment (like compost or bark and steer) to the soil as you backfill around your tree will provide nutrients to the roots and help retain soil moisture. Mulch. Cover the top of the root ball with 2-3 inches of mulch, being careful to keep the mulch pulled away from the main trunk. Mulch helps young trees by moderating soil temperatures, retaining soil moisture and suppressing weeds. To stake or not. Young trees benefit from staking especially in windy areas or if the tree is top heavy. Two or three stakes should be installed around the tree. Secure the trunk with a broad tree strap or a loop of old garden hose. Never tie directly to the trunk with rope, twine or wire as this will damage the trunk and possibly girdle and kill the tree. Fasten the trunk to the stakes loosely enough to allow some trunk movement. This helps to develop a stronger trunk. Remove the stakes after the tree can stand up on its own, usually in one or two seasons. Mycorrhizae. This naturally occurring beneficial fungus helps a tree’s roots grow bigger allowing for better moisture and nutrient uptake. 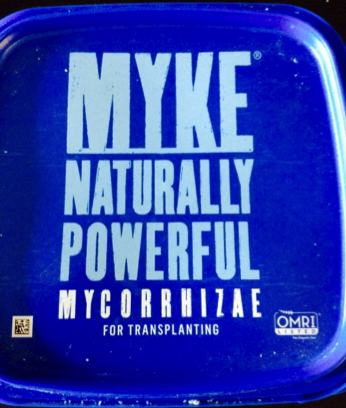 Although it exists in the soil, the addition of supplemental mycorrhizae like Myke™ will increase a tree’s survival rate. Fertilizer. Newly planted trees benefit from a mild fertilizer to help form roots. We recommend Fertilome™ Root Stimulator. Water. This is vital to any tree’s survival. A deep thorough soaking about once a week for the first season will promote deep rooting. The soil should be moistened at least 8 inches under the surface. The easiest way to do this is to place a slow trickling garden hose alongside the trunk. Soaker hoses and drip irrigation are also excellent ways to deliver water to the root zone. Irrigation systems designed for lawns may not deliver enough water to the root zone as these are set up for frequent, shallow watering. Frequent, shallow watering will only promote shallow roots. Deep, infrequent soakings will promote deep roots, allowing trees to establish faster and become more drought resistant. Guarantied success! 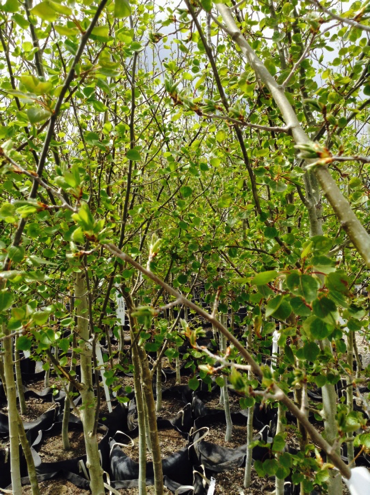 We offer a five year warranty on trees planted using Myke™ mycorrhizae fortransplanting. Imagine stepping out your door, picking a few leaves and brewing your home-grown cup of tea within minutes. Here are some drinkable herbs and flowers for your own home brew. Try adding a few of these plants to an existing flower bed or plant up a separate container to make a ‘tea pot’. Most of these plants will need part-full sun and good drainage. You can mix a time release fertilizer (such as Osmocote™) or an all purpose granular fertilizer into the soil at planting time. To make tea, pour boiling water over leaves and steep for a few minutes. Use only small amounts of these plants in your tea as large doses may be very bitter or harmful. Refrigerate your brew for iced tea. Bee Balm: This plant is a hardy perennial in our region, growing from 2-4 feet tall, depending on the variety. Pink, purple or red flowers attract hummingbirds and bees. Use the leaves for tea. Lemon Balm: This perennial grows 1-2 feet tall. The leaves impart a lemon flavor to tea. Mint: There are many varieties such as apple, pineapple, orange and peppermint to make a refreshing tea. This vigorous perennial should be grown in a container to keep its roots from overtaking garden space. Scented geranium: This annual has many varieties to flavor tea. Use the leaves for tea. Lavender: This tender perennial is beloved for its soothing aroma. Use the stems and flowers for tea. 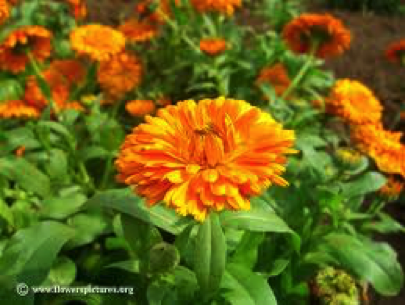 Calendula: This annual can be easily grown from seed or from starts. The flower petals and young leaves will impart a sweet flavor. Stevia: Now gaining popularity as an alternative sweetener, this annual herb will add a sweet taste to your brew. Radishes are possibly the easiest vegetable to grow. Give them a sunny, well drained spot in the garden and they will be ready to harvest in less than a month. These bright roots liven up salads and can add a welcome crunch to tacos or sandwiches. There are many different varieties and colors to try. We love the mild French breakfast radishes and the pretty ‘Easter egg’ mix. 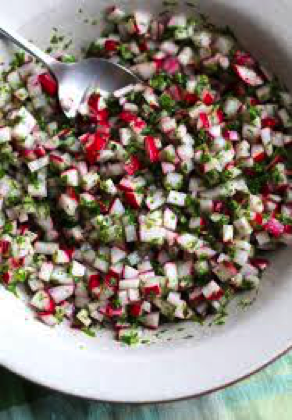 Try this refreshing salad with your home grown crop. Combine all ingredients in a small serving bowl. Serve chilled or at room temperature. Pottery: We’re bursting at the seams with our biggest selection of pottery and planters ever! We have extraordinary ceramics from Vietnam, a new stylish and thoughtfully-designed line of planters from elho™, colorful Mexican pieces, self watering planters, rustic wooden planters, and everything in between. Indoor/Outdoor Rugs: Gorgeous graphics of these easy care poly-woven rugs will brighten your entryway. DeWitt™ N-Sulate frost cloth. Be ready for that inevitable late frost. Protect your plants with durable frost cloth. Available bulk by the foot or in a pre-cut package. Repellex™ systemic tablets: Designed to repel voles, gophers, dogs, cats and deer from ornamental plants. One time application lasts up to a year. Renee’s Garden ™ seeds: Many standout varieties of heirloom vegetable, herb and flower seeds are in stock. Be sure to try one of the outstanding gourmet salad blends. Each package contains detailed planting instructions. 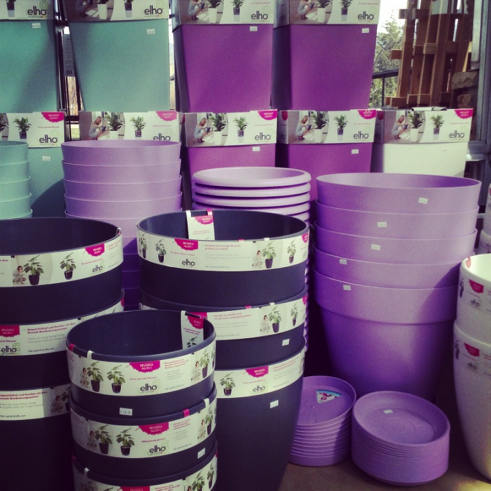 These elho™ planters come with wheels, potting mix and are self-watering.